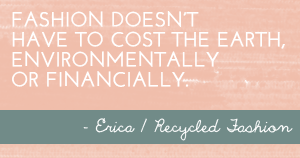 The recycled fashion genre crosses many boundaries, there are no set rules as to what defines the term. 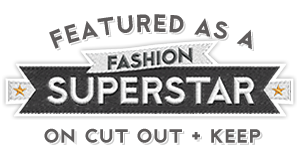 Recycled fashion could cover designer label consignment store shopping, thrift shopping, vintage garments, clothes swapping, refashioning and upcycled fashion. Trash fashion sometimes referred to as "trashion" is used when classifying recycled fashion, meaning otherwise wasteful material that is recreated into wearable art. 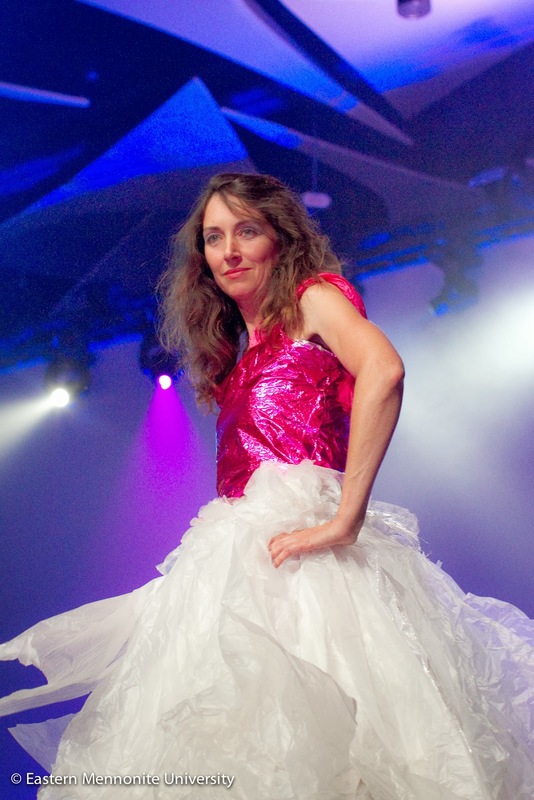 I've touched on creating trash fashion myself when entering the Fashion Less Waste competition in 2011 held by the Australian Museum in Sydney. It was an experience that moved me well out of my own comfort zone, venturing into tricky sewing territory. Would I give it a go again? Possibly, but it would take a lot of thought. If there is anything I've taken away from attempting such an unusual craft, it would be respect to others that sew trash into fashion, it isn't an easy task. 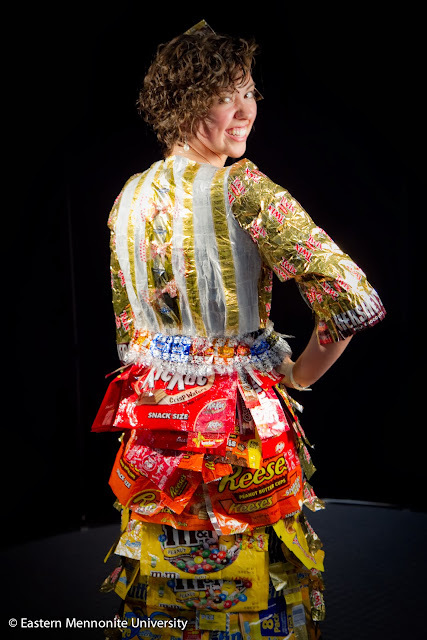 A generation much younger than I have been recreating trash into fashion once a year, for the last three years. 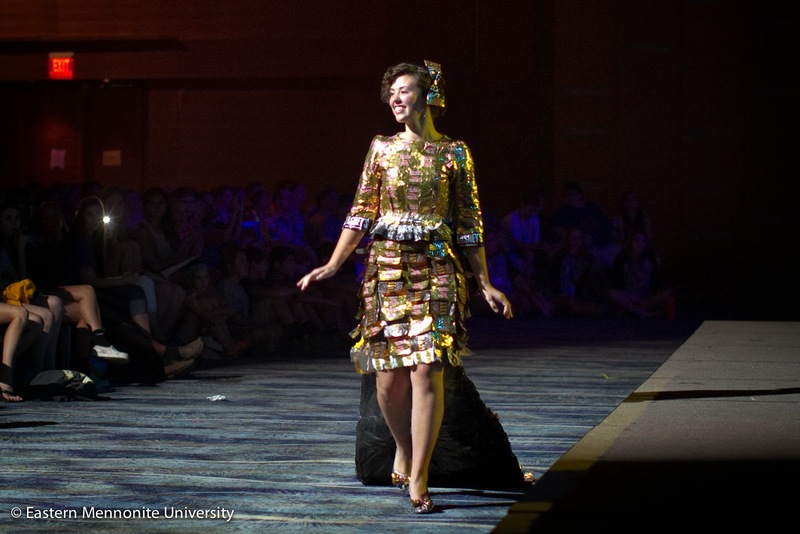 Eastern Mennonite University recently held its third annual Trash Fashion Show at the 2013 Mennonite Convention in Phoenix, Arizona. The outfits in the show were made from "found" materials, combining the importance of recycling with creativity, style and high fashion. Eastern Mennonite University (EMU) art professor, Cyndi Gusler, along with EMU art students, explored the fashion style years ago in an EMU art class and decided to take the fashion show to the Mennonite convention. 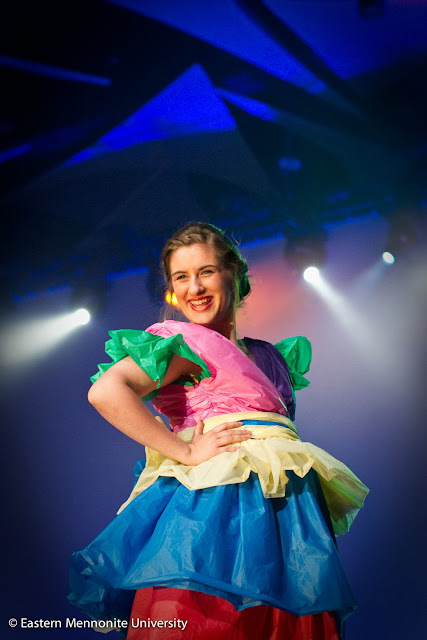 They invited high school students to create outfits and enter to be in the trash fashion show. The Eastern Mennonite University (EMU) art professor that organised the event. Cyndi explains her outfit: "The outfit was inspired by the 1980's and Cyndi Lauper's, 'Girls Just Wanna' have Fun.' Forget taking seriously our role in caring for the earth and ourselves, let's party! The bodice is an aluminum foil party balloon sliced open with zipper added on the side. 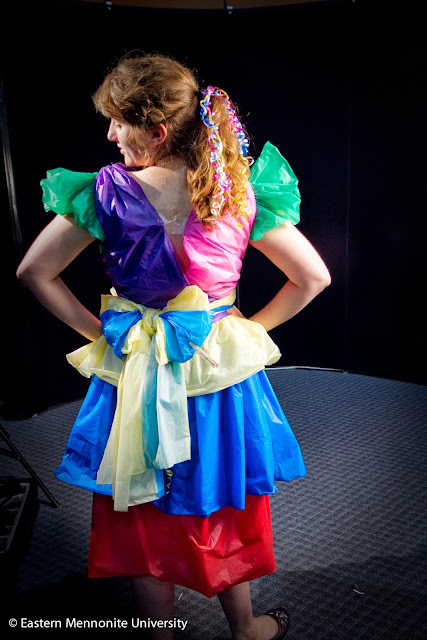 The skirt portion of this '80's prom dress is made from gobs of floral sleeves pulled from the trash bins at the faculty Christmas party at Eastern Mennonite University (EMU). They were used to protect the Christmas poinsettias from the cold in transit from the florist to EMU." Cyndi also noted that the lighting design credit for the show goes to EMU theater professor David Vogel. All photo credits to Jon Styer, emu.edu. 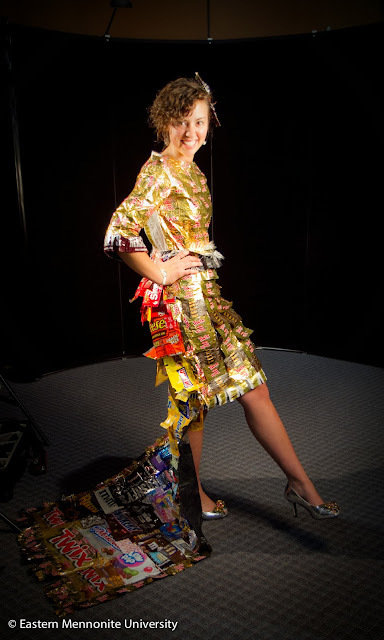 Her dress was made with 178 candy wrappers and bags, including 20 from different countries including Peru, Germany, and Mexico. "Some of the hardest parts were cutting around the torn parts of the tablecloths, piecing together plastic shopping bags so that I had big enough pieces of 'material,' and figuring out how to sew the whole outfit together without ripping the plastic." 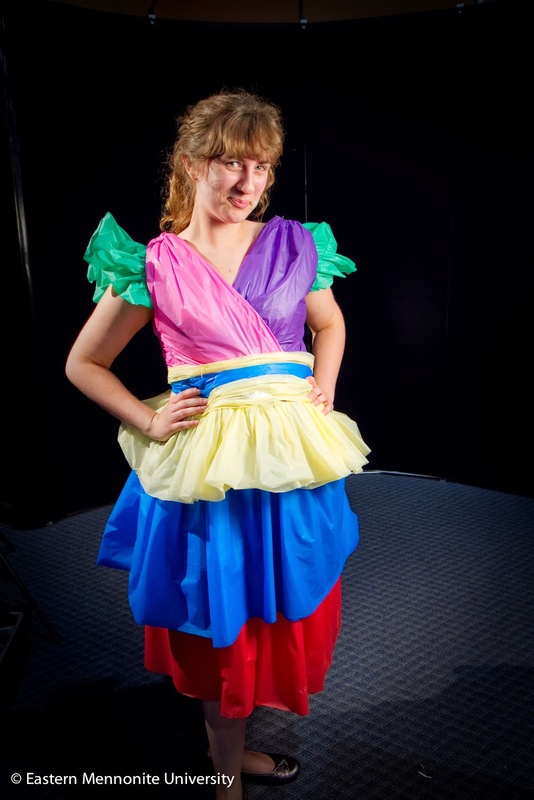 Trash fashion may not be considered practical everyday wear, but should certainly be admired and valued for its creativity and resourcefulness, particularly when demonstrated with a younger generation born and raised in our "throwaway fashion" society.